Think sugar cookies with a boozy, citrusy something extra – WOW! These tender little stars are glazed with sweetened orange liqueur for a cookie finale that’s all grown up. Don’t miss out on the boozy variations on these cookies, below! Step 1) Cream together butter and sugar. Add egg and orange extract. Blend well. Step 2) With a sturdy wooden spoon, mix in flour, cinnamon, cream of tartar, and baking powder. Dough will be stiff. Step 3) Chill dough in a covered container for at least two hours or overnight. Step 4) Whisk together orange liqueur, food coloring, and sugar (a coffee mug works well for this). Step 5) Roll chilled dough 1/4 inch thick on a floured counter top. 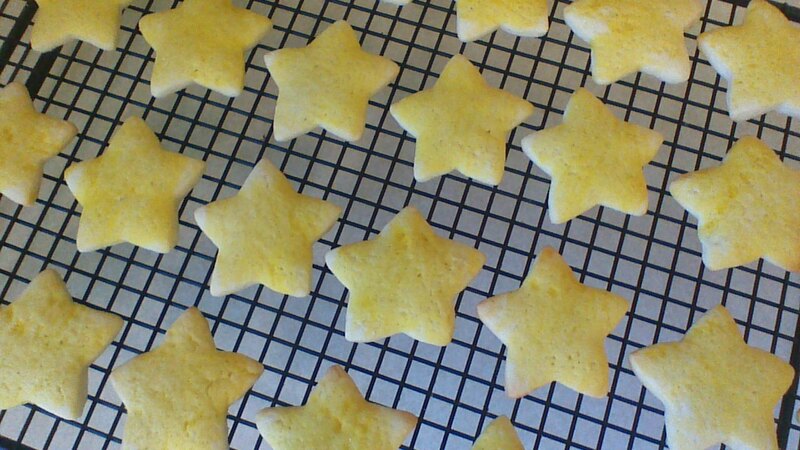 Cut star shapes from dough using a small cookie cutter (mine is approximately 2 1/2 inches in diameter). Step 5) Place stars on cookie sheets lined with parchment paper. Bake in preheated 375 degree oven for 8 minutes, or until bottoms of cookies just begin to brown. Step 6) Immediately transfer cookies to a cooling rack. Use a pastry brush to coat warm cookies with glaze. Allow Orange Star Cookies to cool completely before storing. Caramel Apple Stars: Replace the orange extract in the cookie dough with caramel flavoring. Replace the triple sec orange liqueur with apple schnapps. Replace the orange food coloring with green food coloring. Amaretto Stars: Replace the orange extract in the cookie dough with almond extract. Replace the triple sec orange liqueur with amaretto. Omit food coloring, and sprinkle glazed cookies very lightly with brown sugar. Chocolate Raspberry Stars: Replace the orange extract in the cookie dough with 1 tablespoon of cocoa powder and 1/4 teaspoon of vanilla extract. Replace the triple sec orange liqueur with raspberry schnapps. Replace the orange food coloring with red food coloring. Sprinkle glazed cookies very lightly with red sugar crystals. Thanks! They’re tasty, without being an over-the-top mountain of chocolate and such (not that I don’t love a good chocolate cookie!). Well I know what I am making tonight for tomorrow’s work cookie swap! Great timing!